One of the classical music industry's many paradoxes is that contemporary business practices such as marketing and branding are de rigeur, yet elementary economics are ignored and sometimes even deliberately defied. A recent Overgrown Path post linked the economic concept of the tragedy of the commons - when the result of all members of an interest-based community trying to reap the greatest individual benefit from a shared resource results in the degradation of that shared resource - to the detrimental impact of new technologies such as streaming. While an earlier post pointed out the basic rules of supply and demand mean that the grossly inflated supply of classical music to a market with static or even declining demand is an accident waiting for a place to happen. Another economic law, that of diminishing marginal returns, states that there is a point beyond which the level of benefit gained is less than the amount of additional resource invested. 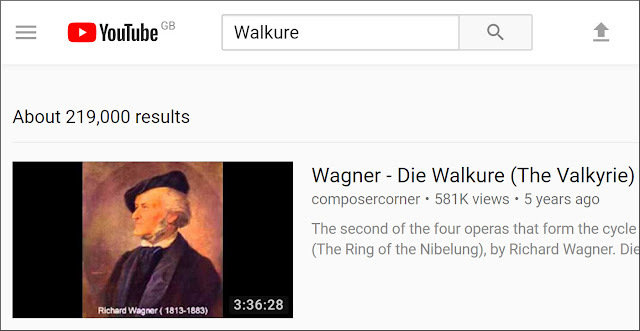 News that the New York Philharmonic Orchestra (NYPO) and its incoming music director Jaap van Zweden are to live stream a concert performance of Act I of Wagner's Die Walküre for free on Facebook has been greeted with widespread approval. But that approval overlooks the all too evident oversupply of streamed Walküre in various forms: as an example a YouTube search for 'Walküre' returns around 191,000 results - see header graphic. One of the themes that is really important is indeed about the impact of technology on music. I am not talking about the use and abuse of social media nor the quality of new sound formats, I am talking about the fact that music is all too easily and readily available on too many medias. Streaming free or fee services are making of performances, as well as works and artists, a replaceable commodity. There is too much music available these days. Mahler fatigue comes because of saturation. You rightly advocate neglected composers like Nielsen, but we are going to be swamped soon with too many recordings of even these composers. The impact of the opening of Nielsen's Third Symphony will start waning in the same way as as has happened to, for instance, Mahler’s Second Symphony. Soon this will be also the case for Lutoslawski & Janacek". Antoine concluded his email with these wise words: "So in 2018, my new year resolutions are to reduce listening to music but ensure that if I listen less to music but that when I listen, regardless of where I am, I will concentrate and focus as if I am in a concert hall". Amen to that. * Antoine Lévy-Leboyer's email has been lightly sub-edited by me in the interests of clarity. Any copyrighted material is included as "fair use" for critical analysis only, and will be removed at the request of copyright owner(s). Also on Facebook and Twitter.